This book reviews the "playing" of Shakespeare in which there is a re-staging and a re-writing -- through adaptation, appropriation, or acculturation -- of the Western Shakespeare into the gestural, symbolic, stylized, or ritualized worlds of Asian theatre languages. It examines this interface in aesthetic, theatrical, cultural and political terms, looking at key issues in intercultural performance, how it re-configures the text, genre and gender and how it can intervene in the shaping of ethnicity, identity and postcoloniality. Contributors examine how differing cultures negotiate such encounters, and the implications of this worldwide re-playing for Shakespeare's theatre. 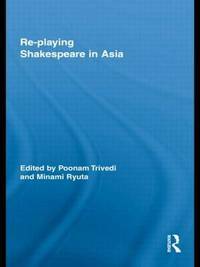 Focusing specifically on the work of major directors in the central and emerging areas of Asia -- Japan, China, India, Korea, Taiwan, Singapore, Indonesia and the Philippines -- the chapters show how performing Shakespeare in Asia not only revitalizes indigenous theatre forms, but generates an alternate cultural capital which is exploited in the global market. Poonam Trivedi is Reader in English at the University of Delhi, India. Ryuta Minami is Professor of English at Aichi University of Education, Japan.